Wild Colours is mobile friendly. 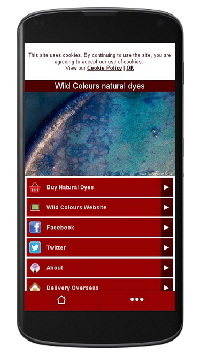 You can buy natural dyes, dye extracts, mordants, dye plant seeds & Hazel Rose looms with your Apple or Android smartphone on the new Wild Colours mobile app at m.wildcolours.co.uk. The list will not be as extensive as the main Wild Colours website but all of the most popular natural dyes, dye extracts, mordants, dye plant seeds & some of the Hazel Rose looms will be there. Click on the ‘Buy Natural Dyes’ tab to buy.